Draft: 2012, New York Yankees, 5th rd. 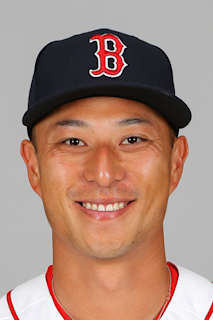 Married to Monica, an All-American swimmer at the University of Arizona, who participated in the 2008 and '12 United States Olympic Trials...The couple got married in 2015 at The Drake Hotel in Chicago - Drake was her maiden name...Was the fourth South Korea-born position player in Major League history: OF Shin-Soo Choo, INF Jung Ho Kang and INF Hee-Seop Choi. Appeared in 40 games with the Rays and hit .167 with 3 doubles, 2 home runs and 5 RBI…also played in 51 games with Triple-A Durham, batting .283 with 10 doubles, 4 home runs and 15 RBI...Made 21 starts in left field for the Rays, 7 at designated hitter and 3 in right…also appeared in 1 game at first base...Went to Spring Training with the Indians and was traded to the Rays for cash considerations on March 27... Made his first Opening Day roster…was the sixth player since 1908 to start at designated hitter and bat out of the No. 9 spot in the lineup: Kelly Johnson/TB (2013), Nick Johnson/NYY (2002-03), Junior Felix/DET (1994), Dave Bergman/DET (1990) and Pat Sheridan/DET (1989)... Homer on April 27 @ Red Sox snapped a 266 at-bat homerless streak (previous: Oct. 1, 2015 vs. Red Sox). Split the season between the New York and Toronto organizations...Optioned out of spring training and was recalled for the first of four times by the Yankees on May 2...Last stint with the Yankees came June 26-July 14 before being designated for assignment on July 19 and traded to the Blue Jays four days later...Was assigned to AAA Buffalo after the acquisition and was recalled on July 29 by Toronto and spent the remainder of the season at the Major League level with the Blue Jays. Overall on the year appeared in 20 games at second base, 10 games in LF, 6 games at first base and 4 games in right field...Second career 3-hit game, Aug. 12 vs. Pittsburgh...Has gone 112 games and 281 plate appearances since his last home run (10/1/15 vs. BOS)...Was 2-for-28 vs. LHP on the year. Hit .250 (38-for-152) with 25R, 9 doubles and 12RBI in 58 games (21 starts at 1B, 14 in RF, 5 at 2B and 4 in LF) over three stints with the Yankees (5/17-26, 5/30-8/11 and 9/2-10/2). Played at 1B, 2B, 3B and in LF and RF at the Major League level…entering the season, had never played 1B or LF in his professional career. His .321 (17-for-53) batting average through his first 20 career games (7/11/15-6/2/16) was the highest by a Yankee since Kevin Thompson hit .323 (10-for-31) in his first 20 career games from 2006-07…the mark was surpassed by Gary Sánchez (.366) later in 2016. Hit safely in 12 straight starts from 9/24/15-6/4/16, batting .390 (16-for-41) with 5R, 7 doubles, 1HR and 7RBI in those games. Doubled in five straight starts from 10/3/15-6/4/16, becoming the first Yankee to do so since José Molina from 4/4-11/08 (also five straight)…became the first Yankee to begin a season with at least 1 double in each of his first four starts since at least 1913. Made his season debut in 5/21 win at Oakland, starting in RF-his first Major League appearance at the position-and going 1-for-3 with 1 double and 2RBI before being removed defensively in the seventh. Made his first start at 1B in his professional career in 6/4 win at Baltimore…was his first of four consecutive starts at 1B from 6/4-7…was 0-for-3 in 6/3 loss at Baltimore, entering the game at 1B in fourth after Teixeira injury…was his first appearance at 1B in any professional game. Hit .357 (15-for-42) with 8R, 4 doubles, 4RBI and 5BB in his 12 starts from 6/11-7/5, hitting safely in nine of those games. Collected a career-high three hits in 6/14 loss at Colorado, going 3-for-5 with 1R. Made his first career appearance at 3B as a defensive replacement on 7/1 at San Diego…made his first appearance-and start-in LF on 7/25 at Houston. In 54 games with Triple-A Scranton/Wilkes-Barre, hit .316 (66-for-209) with 25R, 10 doubles, 2HR, 20RBI and 6SB (in six chances)…hit .397 (23-for-58) with 9R, 6 doubles, 2HR and 5RBI in 15 games in May, including a multi-HR game on 5/15 vs. Indianapolis. Batted .302 (13-for-43) with 3R, 3 doubles, 2HR, 5RBI, 3BB and 2SB in 16 games with the Yankees (12 starts at 2B) over two stints with the Yankees (7/11-19 and 9/1-10/4)...Became just the second South Korea-born player to play for the Yankees, joining RHP Chan Ho Park (27 relief appearances for the team in 2010)...became only the fourth South Korea-born position player in Major League history (also Texas OF Shin-Soo Choo, Pittsburgh INF Jung Ho Kang and former INF Hee-Seop Choi)...Hit .385 (5-for-13) off right-handed pitching compared to .267 (8-for-30) off left-handed pitching...Made his Major League debut in 7/11 loss at Boston, starting at 2B and going 0-for-3...was signed to a Major League contract and selected to the Yankees' 25-man roster from Triple-A Scranton/Wilkes-Barre prior to the game...Hit two-run HR off Alexi Ogando-the first homer of his Major League career-in the ninth and was 2-for-4 in 7/12 win at Boston...recorded his first career hit with a seventh-inning single off Tommy Layne...became the first Yankees second baseman since at least 1914 to homer in either of his first two Major League games...Started eight of the Yankees' final 11 games at 2B (beginning on 9/24)...hit safely in all eight of those starts, batting .393 (11-for-28) with 2R, 3 doubles, 1HR, 3RBI, 3BB and 2SB...Was 2-for-4 with 1 double, 1RBI, 2BB/1IBB and 1SB in 9/30 loss vs. Boston, becoming just the second Yankee since 2011 to reach base safely at least four times in a game within his first 13 career games, joining Yangervis Solarte (4/3/14 at Houston in his second career game)... collected his first career stolen base in the seventh inning...Hit .271 (122-for-450) with 66R, 28 doubles, 2 triples, 9HR, 56RBI and 12SB in 117 games with Scranton/WB...through 8/31, ranked fifth in the IL with 56BB...Was named International League "Player of the Week" for the period from 5/11-17, batting .400 (12-for-30) with 6R, 4 doubles, 2HR and 6RBI over the stretch...hit 2HR on 5/17 at Durham...Hit safely in 16 of 17 games with the RailRiders from 6/24-7/22, batting .404 (23-for-57) with 13R, 5 doubles, 2HR, 10RBI and 16BB over the span...reached safely via hit or walk in all 17...In 26 spring training games, hit .364 (16-for-44) with 10R, 6 doubles, 1HR, 7RBI, 8BB and 2SB...tied for second on the team in hits...Following the season, was ranked by Baseball America as the No. 8 prospect in the Yankees organization...was also tabbed by MiLB.com as an Organization All-Star. Combined with Double-A Trenton and Triple-A Scranton/Wilkes-Barre to bat .318 (164-for-515) with 82R, 38 doubles, 6 triples, 14HR, 63RBI, a .497 slugging pct. and .387 OBP...ranked third among Yankees minor leaguers in batting average...Hit .385 (55-for-143) off left-handed pitching, compared to a .293 (109-for-372) mark vs. right-handers...Posted a .977 fielding percentage at 2B (12E, 528TC), including a .988 mark with Scranton/WB (3E, 245TC)...also made nine starts in RF with the RailRiders (0E, 14TC)...Began the season with Trenton, hitting .342 (78-for-228) with 35R, 19 doubles, 5 triples, 6HR and 30RBI in 60 games...Was named Eastern League "Player of the Week" for the period from 5/26-6/1, batting .500 (14-for-28) with 7R, 6 doubles, 2 triples, 1HR and 7RBI in seven games over the span... Recorded multiple hits in 15 of his final 17 games with the Thunder, batting .493 (34-for-69) with an .855 SLG% (10 doubles, 3 triples, 3HR) over the span from 5/22-6/8...Was promoted to Scranton/WB on 6/10 and spent the remainder of the season there, batting .300 (86-for-287) with 47R, 19 doubles, 8HR and 33RBI in 77 games... had 27 multi-hit games with the RailRiders...went 6-for-31 in his first eight Triple-A games, but hit .313 (80-for-256) over his final 69 games...Hit a three-run "walk-off" HR on 7/4 vs. Buffalo, earning him a 2014 MiLBY Award for "Best Home Run"... hit a "walk-off" RBI double in 8/31 win vs. Lehigh Valley...Following the season, was ranked by Baseball America as the Yankees' seventh-best prospect...was also tabbed an Organization All-Star by MiLB.com...was also named to the Baseball America Triple-A All-Star team. Combined at Single-A Tampa and Single-A Charleston to bat .293 (137-for-467) with 75R, 32 doubles, 3 triples, 6HR and 57RBI in 130 games...stole 23 bases in 29 attempts (79.3%)...ranked fourth among Yankees minor leaguers in stolen bases and third in batting average...Started a combined 108 games at 2B, his first season at the position (25E, 441TC)...Began the season with Charleston, batting .370 (20-for-54) with 9R, 4 doubles and 6RBI in 13 games...Was transferred to Tampa on 4/18 and spent the remainder of the season there, hitting .283 (117-for-413) with 66R, 28 doubles, 6HR and 51RBI in 117 games...ranked second in the Florida State League in walks (78) and OBP (.408)...led Tampa in runs scored and walks, and tied for the team lead in doubles...Hit safely in his final six games with Charleston and his first 12 games with Tampa, combining to bat .405 (30-for-74) during that stretch (4/12-30)...Following the season, was tabbed by MiLB.com as an Organization All-Star. Made his professional debut with Single-A Charleston, batting .241 (39-for-162) with 8 doubles, 4HR and 22RBI in 46 games...made 42 starts in RF and four at DH. April 7, 2019 Arizona Diamondbacks traded OF Rob Refsnyder to Cincinnati Reds for Player To Be Named Later. April 7, 2019 OF Rob Refsnyder assigned to Louisville Bats. November 26, 2018 Arizona Diamondbacks signed free agent OF Rob Refsnyder to a minor league contract and invited him to spring training. November 26, 2018 OF Rob Refsnyder assigned to Reno Aces. November 2, 2018 RF Rob Refsnyder elected free agency. June 22, 2018 Tampa Bay Rays sent RF Rob Refsnyder outright to Durham Bulls. June 19, 2018 Tampa Bay Rays designated LF Rob Refsnyder for assignment. March 27, 2018 Cleveland Indians traded LF Rob Refsnyder to Tampa Bay Rays for . December 2, 2017 2B Rob Refsnyder assigned to Gigantes del Cibao. November 20, 2017 Cleveland Indians claimed 2B Rob Refsnyder off waivers from Toronto Blue Jays. July 29, 2017 Toronto Blue Jays recalled 2B Rob Refsnyder from Buffalo Bisons. July 25, 2017 2B Rob Refsnyder assigned to Buffalo Bisons. July 23, 2017 Toronto Blue Jays traded 1B Ryan McBroom to New York Yankees for 1B Rob Refsnyder. July 19, 2017 New York Yankees designated 1B Rob Refsnyder for assignment. July 14, 2017 New York Yankees optioned 1B Rob Refsnyder to Scranton/Wilkes-Barre RailRiders. June 26, 2017 New York Yankees recalled Rob Refsnyder from Scranton/Wilkes-Barre RailRiders. June 22, 2017 New York Yankees optioned 1B Rob Refsnyder to Scranton/Wilkes-Barre RailRiders. May 25, 2017 New York Yankees recalled Rob Refsnyder from Scranton/Wilkes-Barre RailRiders. May 15, 2017 New York Yankees optioned 1B Rob Refsnyder to Scranton/Wilkes-Barre RailRiders. May 14, 2017 New York Yankees recalled Rob Refsnyder from Scranton/Wilkes-Barre RailRiders. May 8, 2017 New York Yankees optioned 1B Rob Refsnyder to Scranton/Wilkes-Barre RailRiders. May 2, 2017 Rob Refsnyder assigned to New York Yankees from Scranton/Wilkes-Barre RailRiders. March 30, 2017 New York Yankees optioned 1B Rob Refsnyder to Scranton/Wilkes-Barre RailRiders. September 2, 2016 New York Yankees recalled Rob Refsnyder from Scranton/Wilkes-Barre RailRiders. August 11, 2016 New York Yankees optioned 3B Rob Refsnyder to Scranton/Wilkes-Barre RailRiders. May 30, 2016 New York Yankees recalled Rob Refsnyder from Scranton/Wilkes-Barre RailRiders. May 26, 2016 New York Yankees optioned 2B Rob Refsnyder to Scranton/Wilkes-Barre RailRiders. May 17, 2016 New York Yankees recalled Rob Refsnyder from Scranton/Wilkes-Barre RailRiders. March 27, 2016 New York Yankees optioned 2B Rob Refsnyder to Scranton/Wilkes-Barre RailRiders. September 1, 2015 New York Yankees recalled Rob Refsnyder from Scranton/Wilkes-Barre RailRiders. July 19, 2015 New York Yankees optioned 2B Rob Refsnyder to Scranton/Wilkes-Barre RailRiders. July 11, 2015 New York Yankees selected the contract of Rob Refsnyder from Scranton/Wilkes-Barre RailRiders. February 5, 2015 New York Yankees invited non-roster 2B Rob Refsnyder to spring training. June 10, 2014 2B Rob Refsnyder assigned to Scranton/Wilkes-Barre RailRiders from Trenton Thunder. March 31, 2014 2B Robert Refsnyder assigned to Trenton Thunder from Tampa Yankees. March 13, 2014 IF Robert Refsnyder assigned to New York Yankees. April 18, 2013 2B Robert Refsnyder assigned to Tampa Yankees from Charleston RiverDogs. July 10, 2012 Robert Refsnyder assigned to Charleston RiverDogs from New York Yankees. July 6, 2012 New York Yankees signed OF Robert Refsnyder.